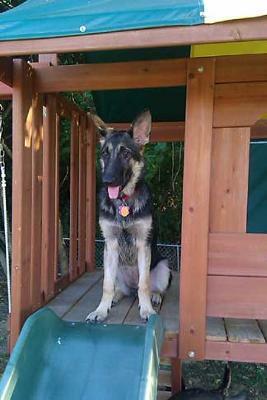 Hi this is my princess Bella, she is a six month old GSD. She loves to claim our playground as her castle, she will actually climb up the rock walk ladder to get to the top. She has the greatest personality with people and dogs. She works with me to evaluate GSD's at local shelters so that they can be fostered then adopted from our rescue. So this little princess has a big job.